On the 10th (Wed), take in nature's colorful creations at International Rose Test Garden. For maps, traveler tips, where to stay, and tourist information, read our Portland travel planner . Denver to Portland is an approximately 5-hour flight. You can also drive; or take a bus. Due to the time zone difference, you'll gain 1 hour traveling from Denver to Portland. In July in Portland, expect temperatures between 83°F during the day and 59°F at night. Cap off your sightseeing on the 11th (Thu) early enough to go by car to Seaside. Seaside is a city in Clatsop County, Oregon, United States. 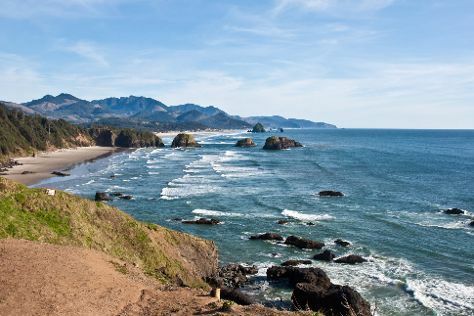 Kick off your visit on the 11th (Thu): kick back and relax at Cannon Beach, then kick back and relax at Haystack Rock, and then immerse yourself in nature at Hug Point State Park. Find out how to plan Seaside trip without stress by asking Inspirock to help create an itinerary. You can drive from Portland to Seaside in 2 hours. Another option is to take a bus. Traveling from Portland in July, you will find days in Seaside are slightly colder (69°F), and nights are about the same (55°F). Finish your sightseeing early on the 12th (Fri) so you can drive to Astoria. Start off your visit on the 12th (Fri): pause for some photo ops at Astoria Column, then admire the majestic nature at Fort Stevens State Park, and then steep yourself in history at Clark's Dismal Nitch. For traveler tips, photos, reviews, and tourist information, go to the Astoria trip tool . Astoria is just a stone's throw from Seaside. July in Astoria sees daily highs of 69°F and lows of 55°F at night. Wrap up your sightseeing on the 12th (Fri) to allow time to drive to Seaside. Start off your visit on the 12th (Fri): don't miss a visit to Turnaround at Seaside. For reviews, traveler tips, maps, and other tourist information, go to the Seaside trip planner . Seaside is just a short distance from Astoria. You will have some time to spend on the 13th (Sat) before leaving for Tillamook. The city of Tillamook is the county seat of Tillamook County, Oregon, United States. Kick off your visit on the 13th (Sat): identify plant and animal life at Nevor Shellfish Farm and then immerse yourself in nature at Cape Lookout State Park. For more things to do, traveler tips, photos, and more tourist information, you can read our Tillamook route planner. Getting from Seaside to Tillamook by car takes about 1.5 hours. Other options: take a bus. The time zone difference when traveling from Seaside to Tillamook is 1 hour. Expect a daytime high around 69°F in July, and nighttime lows around 52°F. Finish your sightseeing early on the 13th (Sat) so you can drive to Lincoln City. Lincoln City is a city in Lincoln County, Oregon, United States. To see traveler tips, photos, ratings, and other tourist information, use the Lincoln City travel route website . Traveling by car from Tillamook to Lincoln City takes 1.5 hours. Alternatively, you can take a bus. The time zone difference moving from Mountain Standard Time (MST) to Pacific Standard Time (PST) is minus 1 hour. Expect little chillier weather when traveling from Tillamook in July: highs in Lincoln City hover around 63°F, while lows dip to 50°F. On the 14th (Sun), you're off toEugene. Eugene is a city of the Pacific Northwest located in the U.S. You'll visit kid-friendly attractions like Sandland Adventures and Sand Master Park. Explore Eugene's surroundings by going to Florence (Sea Lion Caves, Siuslaw River Bridge, & more). There's still lots to do: explore the landscape on two wheels at Willamette River bike trail and look for all kinds of wild species at Cascades Raptor Center. Start your trip to Eugene by creating a personalized itinerary on Inspirock. Traveling by car from Lincoln City to Eugene takes 2.5 hours. Alternatively, you can do a combination of bus and train; or take a bus. While traveling from Lincoln City, expect much warmer days and about the same nights in Eugene, ranging from highs of 86°F to lows of 53°F. Finish your sightseeing early on the 17th (Wed) so you can drive to Portland. Kick off your visit on the 17th (Wed): tour the pleasant surroundings at Oregon Zoo, then take in the dramatic scenery at Multnomah Falls, and then see the interesting displays at Oregon Museum of Science and Industry. On the 18th (Thu), you'll have a packed day of sightseeing: savor the flavors at Food & Drink. To see where to stay, ratings, maps, and tourist information, use the Portland tour itinerary maker tool . Traveling by car from Eugene to Portland takes 2 hours. Alternatively, you can take a bus; or fly. Traveling from Eugene in July, expect somewhat warmer with lows of 59°F in Portland. On the 19th (Fri), wrap the sightseeing up by early afternoon so you can travel back home.